Newly formed indie super group Real Boys (Featuring members of Oh No! Yoko, You Say Party! We Say Die!, and GSTS!) is playing at Tweaked and Yummy. They will be joined by spoken word performance poet Nathan Hare. 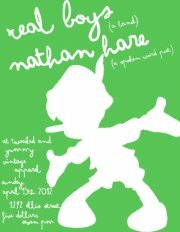 Nathan Hare is a spoken word performance poet from Kelowna, BC. His topics range from his ex-girlfriend’s cat to homophobia, from faith to high school, to youth and love. Sometimes funny, sometimes sad, sometimes both. In his spare time he tries to be nice. Formed in April 2011 as a side project for lead singer Everett Morris’ song writing, Real Boys arrive with fresh-faced enthusiasm and the bravery to wander on tangents. Their two guitar attack dispensing strong melodies against an air-tight rhythm section, these summery tunes will have you dancing through winter. Featuring members of You Say Party! We Say Die!, On No! Yoko, and GSTS!. ← Streaming Cafe – Sea + Air Saturday, April 7th.